Or its practices? Catholic church sanctioned holy wars suggest they didn't think the Holy Grail a myth back then. The question is about its' origins, source. Although the Grail folklore seems to stem from the same centuries as the crusades due to Arthurian legends. Here is a little insight to its' origins. The origins are a mix of cultures. The medieval Church took no official stance on Grail folklore. Pope John Paul II himself celebrated Mass with the Holy Chalice in Valencia in November 1982. In 2006 at Valencia, Pope Benedict XVI also celebrated with the Holy Chalice, on this occasion saying “this most famous chalice”, words in the Roman Canon said to have been used for the first popes until 4th century in Rome, and supporting in this way the tradition of the Holy Chalice of Valencia. 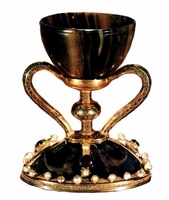 - The Holy Chalice of Valencia: Is it the Holy Grail? The answer is no, the legend of the Grail does not source to Catholicism. According to NewAdvent.org who offers the Catholic Encyclopedia, the Catholic Church basically ignored the legend of the grail. A word as to the attitude of the [Roman Catholic] Church towards the legend. It would seem that a legend so distinctively Christian would find favour with the Church. Yet this was not the case. Excepting Helinandus, clerical writers do not mention the Grail, and the Church ignored the legend completely. After all, the legend contained the elements of which the Church could not approve. Its sources are in apocryphal, not in canonical, scripture, and the claims of sanctity made for the Grail were refuted by their very extravagance. Moreover, the legend claimed for the Church in Britain an origin well nigh as illustrious as that of the Church of Rome, and independent of Rome. It was thus calculated to encourage and to foster any separatist tendencies that might exist in Britain. As we have seen, the whole tradition concerning the Grail is of late origin and on many points at variance with historical truth. I highlighted a couple of lines about which comments must be made. First as to its point about a possible source, since when does the Catholic Church reject beliefs simply because it is not in Scripture? It doesn't. The real reason the Catholic Church supposedly ignored the Grail was because if true, its origins would place England as equal to, if not above, Rome, and certainly independent of her. Don't go searching for something that, if found, harms your credibility. If one knows the history of the Easter controversy, one could probably understand this more deeply. So, long before Rome arrived, which NewAdvent is giving a nod to, Christians had arrived who observed Pascha (Easter like) on the 14th of the moon. When Rome finally arrived later, there was controversy over this because Rome observed the Sunday following the full moon following the Spring Equinox. PS. The Valencia Chalice is not the Grail. Not the answer you're looking for? Browse other questions tagged catholicism biblical-basis church-history origin or ask your own question.